Tyers Mahogany Cased, 15 Position Train Describer. Tyers mahogany cased, 15 Position Train Describer. 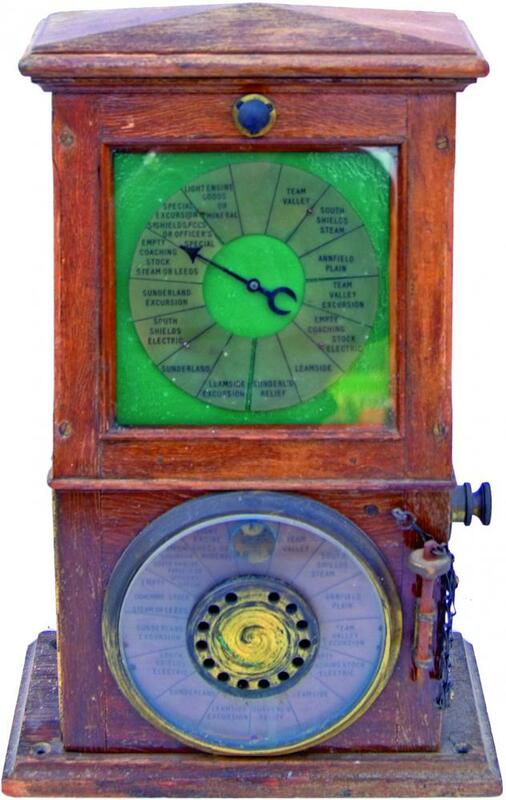 Magnificent instrument with top dial showing the following segments clockwise: Team Valley; South Shields Steam; Annfield Plain; Team Valley Excursion; Empty Coaching Stock Electric; Leamside; Sunderl'd Relief; Leamside Excursions; Sunderland; South Shields Electric; Sunderland Excursions; Empty Coaching Stock Steam Or Leeds; Special Excursion South Shields Parcels Or Officers Specials; Light Engine Goods Or Mineral. These segments are repeated in the lower dial. Complete with Peg and when the mechanism is activated, the clockwork ratchet works fine. A rare opportunity to obtain an elusive instrument from Gateshead Signal Box.